The New York Times recently released a poll showing Obama’s popularity spread much higher than any other active poll at +37. With a margin of error of only +/-3% how can this be explained? Even among “Adults” polling, the New York Times poll is still way outside the norm. Within 24 hours of the NYT/CBS poll a NBC/WSJ “Adults” poll only had Obama at +22%. The key is with the statistical sampling they don’t print in their “news” article. Obama won the actual popular vote by a 52.87%-45.61% margin. Not by a 2:1 margin. The actual results of the election are not subject to opinion or any margin of error. They are a known quantity. With the known numbers right, the NYT numbers must be wrong. 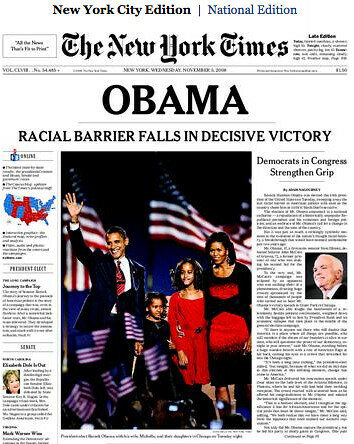 The NYT sample shows an Obama victory 4 times the size of his actual victory. McCain fared better than these national numbers even here in Massachusetts. The NYT poll shows only 26% of the people voting against Obama also shows his negatives at 26%. In reality over 47% of the people voted against Obama. What are his actual negatives? Previous: Jon and Kate plus 8…..
Next: Ayatollah Khamenai: It’s all good!